But I am always looking for new ways to add to my leftover repertoire, and I think I might have the biggest, best and most complicated leftover yet with this Moroccan B’Steeya recipe. But it’s worth every loving moment put into it – and having leftover turkey and my Best Turkey or Chicken Broth made from the carcass makes it a lot easier! I fell in love with the idea of Moroccan B’Steeya when leafing though a Martha Stewart Magazine (Oh, why do I DO that to myself!) and then adapted it for an after Thanksgiving extravaganza. This is a big recipe, feeding 10 -12, so would be perfect for a get-together over the weekend or if you have a house full of company. I did make a few variations in the recipe to make it more budget friendly – sorry no saffron, although you could certainly add the 1/2 teaspoon. Without saffron, recipes can use a little pepping up, so in goes a touch of cayenne and a little additional garlic – this time in the form of powder for the intensity, and a touch more of the preserved lemon. Turkey B’Steeya, yeah, it’s partially gone – but it shows so much better in this light! The recipe for Preserved Lemons as well as a few more photos coming soon! (update: posted) In the meantime, everyone have a lovely and safe holiday! Mix shredded turkey and preserved lemon together, set aside. In a stockpot, melt butter, add onion and saute several minutes until beginning to soften. Add garlic and cook about a minute. Add spices and cook until fragrant. Add stock, bring to a simmer. In the meantime, beat eggs, then add to the gently simmering broth. Add in lemon juice. Simmer slowly, stirring now and then, until the almost no liquid remains, an hour to an hour and 15 minutes. Set aside. While the egg mixture is simmering, finely chop almonds. Add two tablespoons oil to a large skillet and add almonds, cooking over medium high heat, stirring often. Cook until the color just begins to turn toasty and they are warm and fragrant, several minutes. Immediately turn out to cool. When cool, add the tablespoon of cinnamon and powdered sugar and set aside. Clarify the 1/2 cup of butter. Melt in microwave or stove top, allow to sit for several minutes. Carefully drain off the liquid into a small container, leaving the solids behind. Reserve the liquid, discard solids. In a 10 inch cake pan with 2 inch sides or other appropriate container, brush bottoms and sides with clarified butter. Working with one piece of phyllo at a time, brush the top with the butter and layer into your baking dish with a point out. Repeat with six more sheets of dough off setting each one as you work your way around the dish, leaving an overhang off the sides. Fill first with 1/2 the turkey mixture, then 1/2 the almond mixture, then the egg mixture. Repeat. Bring all layers from the sides up and over the top. Prepare 4 more sheets of phyllo by brushing with butter; both sides should be covered, so an easy way to do so it to brush one sheet on top, then turn it over and brush the new side. Then layer on another piece, smoothing it into the butter on the piece below, then brushing the top of the new piece with butter and so on. 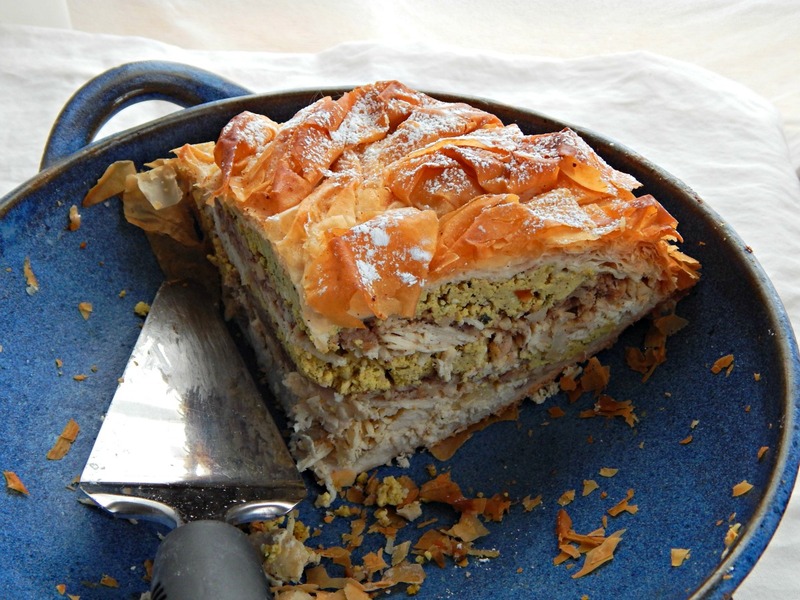 Carefully remove each piece from the small stack of phyllo and crumple and place on top of casserole. Brush very lightly with melted butter. Bake at 375 for about 35 to 40 minutes. Dust with a little powdered sugar and cinnamon. I’ll be bringing this dish to Fiesta Friday, cohosted by Loretta @ Safari of the Mind and Petra @ Food Eat Love and Throwback Thursday. Check the links to see lots of holiday ideas! This entry was posted in Click here for Bargain Meals, Click here for Fabulous Food Posts and tagged Bargain Meal of the Week, Frugal Hausfrau, Heritage Recipe, leftover turkey, Leftovers, Moroccan, Phyllo, planned leftovers, Preserved Lemon, Turkey. Bookmark the permalink. I knew you would like these flavors, Elaine! Thanks, Jay – hope you had a wonderful holiday! We’re watching the original White Christmas right now, which we found on Netflix! Thanks! I can’t tell you how much we liked it! I was worried about the folks (in their 80’s) but they just went on and on about it.